Colourisma: 5 Art life lessons I learned from a… ferret? 5 Art life lessons I learned from a… ferret? This week I had the pleasure of babysitting a friend's pet ferret. 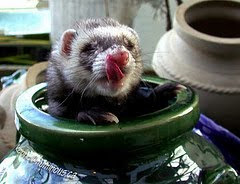 If you are unfamiliar with ferrets, they are a small carnivorous mammal, related to and about the size of a weasel. They are known for being absolutely crazy! I have been thinking lately about getting more into the art industry and I realised there were quite a lot of things I could learn from this little ferret! If you know nothing about ferrets, know this first: They never give up! My grandma had a ferret who, whenever she got out of her cage in the morning, beelined straight for the refrigerator and tried to move the thing. Ferrets will always try to go where you don't want them to be, and they will always go there no matter how many times you pull them away and move them somewhere else. They are determined little creatures! And this applies to art... how? Even if you feel like you've been knocked around or prevented from going where you want to go, never give up. No matter how many times it feels like you have been blocked from your goals, you have to get up, keep marching on and try again. This applies to yourself and your art as well. Even if you are frustrated with a piece, stay course and don't quit. That frustration is a way of learning, once you get past it, you will be so much more knowledgeable and thank yourself later for not losing focus. #2. You always have more fun with friends! There is nothing more sad than a lonely ferret. Even if you do nothing at all, your very presence in their vicinity brightens their whole little world. It was hard to resist spending all of my free time in the evenings in the playpen with the little animal, as she used me as a human jungle gym. If I wasn't playing with her she seemed to get lonely and despondent. Like ferrets, humans are gregarious. We need the company of our fellow man. Without them, we also get lonely. With encouragement from your friends or online pals, you can do anything. If you are ever feeling down about your artwork, be sure you are making strides to let people know about your work. Post your work online or show your sketchbook to fellow artists. Nothing can be more uplifting than a someone giving you a good critique on your art. #3. Bite and if that doesn't work, make a little noise! Ferrets are known for being quite feisty. They will play nip (and sometimes get a little zealous about it- OUCH!) to get your attention. And when that fails, or if they are being held too long, they will make all sorts of noise to let you know what they want! If you never put your stuff out there, you will never become famous. Regardless to what some may say, you won't get famous for your artwork after you die. That is the exception, not the norm. You have to bite! By which I mean, you have to get people's attention by aggressively showing off your artwork. You have to self promote. The internet is a wonderful medium for such, but it is also an immense ocean. You have to try really hard to get yourself seen above the crowd. Make some noise if you have to! Ferrets have this peculiar habit of resembling a light switch. They always appear to be one of two ways, on or off. When they are on, they are 110% playful, in your face, loving life and having fun. When they are off, they are almost in a state of comatose. They sleep a lot and hard. Some people even have ferrets that are such sound sleepers that they can be picked up and moved around without waking up! Now that's what I call out like a light! When you are at half energy, it's really hard to produce good quality work. Take care of yourself, get good sleep, exercise and eat healthy. When you do these things, when the time comes to concentrate on art, you can be at 110%, at top gear and enjoying yourself immensely. When you are sleepy, exhausted and only have the power of coffee keeping you awake, you can hardly concentrate on your goals in art or otherwise. Make sure to take care of yourself so you can be "on" when working on your art! Ferrets have a move called war dancing, where they frantically jump around in pure joy, huffing with their mouths wide open in what can only be called a grin. They have a pure joy of life that you will be hard pressed to find in any other animal. It almost seems like nothing can get their little spirits down! No one can make you get excited about art, you just have to reach from inside and find the love for it for yourself. You really have to be passionate about it. There is an inner joy I believe all humans posses that inspires them to want to create, you have to find that tap and let it flow. After all, art is what you want to do, right? Is there an animal you think you can learn artistic lessons from? Feel free to share in the comments! Ferrets are such wonderful, funny animals. I thinks this could apply to lessons in general about life itself. Never stop trying, even if you fail, don't give up! You gain experience through your failures. Adrian- Lonely is good for some things! I think many will agree that most of the time you produce better results when happy!